KATHMANDU, JUNE 6: Born in Ruwakhola, Asigram-5 of Dadeldhura district, Mahakali Zone in 1946, Sher Bahadur Deuba is a founding member of the Nepali Congress (NC) student wing, Nepal Students Union (NSU), and was its president from 1971 and 1980. As a student leader, Deuba was active in championing multi-party democracy in the national referendum held in 1980 and also played a leading role in the civil disobedience movement organized by the NC in 1985. After the success of the 1990 movement for the restoration of democracy, Deuba acted as Far-Western Regional Political In-Charge of the NC for some time. Deuba was home minister from 1991 to 1994 after being elected to parliament from Dadeldhura district in the general election held in 1991. He became prime minister for the first time from September, 1995 to March, 1997 as internal wrangling within the NC made it impossible for then senior NC leader Girija Prasad Koirala to hold on to the prime ministership. It was during Deuba"s premiership that the then CPN (Maoist) launched their armed insurgency after he allegedly turned down a 40-point demand. Deuba became the 40th prime minister of the country on Tuesday with the support of the same Maoist outfit which his government once declared a terrorist organization. It was also Deuba's governmemt which put a bounty on the head of then rebel leader Pushpa Kamal Dahal aka Prachanda, dead or alive. 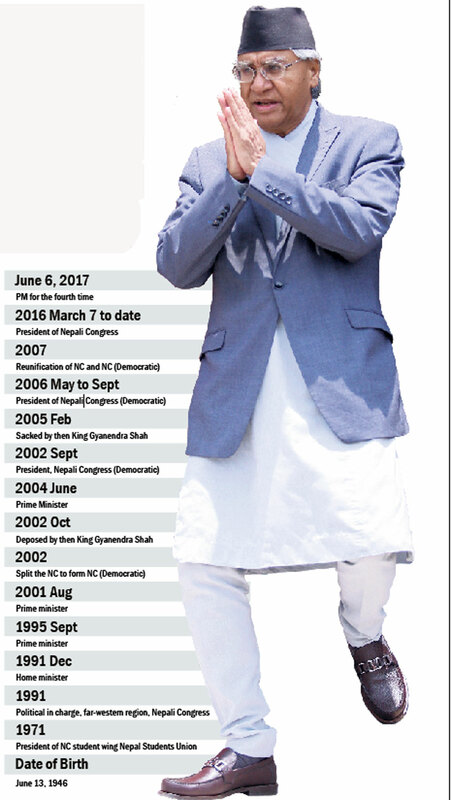 Deuba went on to get re-elected to parliament from Dadeldhura with the highest margin of votes in the mid-term election held in 1999. As Member of Parliament and a Central Working Committee member of the NC, Deuba was head of the High Level Recommendation Committee for the Resolution of the Maoist Problem, from December 1999 to October, 2000. Following serious disputes with Koirala, the then party president, Deuba defected from the NC and formed a new party called Nepali Congress (Democratic) under his own leadership in September, 2002. 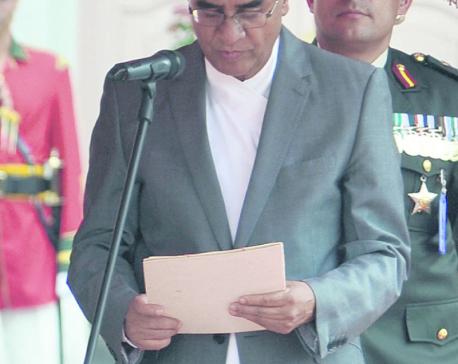 As head of a new political party, Deuba was elected prime minister for the second time in August 2001. But he was unceremoniously deposed by King Gyanendra in October, 2002. Gyanendra again appointed Deuba as prime minister in June 2004 and remained in the post until he was ousted following the royal takeover of February 1, 2005. Nearly a year after being re-elected unopposed as president of his party, following the success of the people's movement of April, 2006, the NC (Democratic) merged with the mother party NC in September, 2007. Deuba served as senior leader of the party until he was elected as president in the 13th general convention held in March, 2016. He defeated Ram Chandra Poudel. Deuba"s has been a long political career, but he has also drawn huge controversy for some of his doings. Much criticized for forming the largest cabinet in Nepal's history, he came under flak within the party for dissolving parliament and "surrendering democracy" to the palace in 2002. 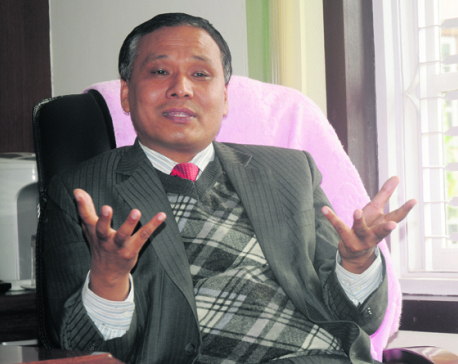 Gyanendra subsequently sacked him again, calling him incompetent for failing to hold elections in the scheduled time. Deuba was also criticized for his decision to allow lawmakers to import motor vehicles without paying customs duty and for appeasing them with foreign junkets and anything else possible, at cost to state coffers. These moves were aimed at consolidating his hold in parliament. Deuba’s return to power: Can he prove doubters wrong?